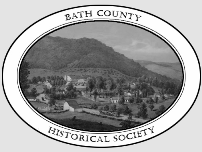 The Bath County Historical Society Needs Your Help!! We are in dire need of space at the museum, and are working toward making an expansion. In December 2016, the society receved a challenge grant in the amount of $85,000. Wow!! In order to receive those funds, we have to raise a matching amount - thus the name "Challenge Grant". Making a donation is a great way to honor your loved ones, past and present. We look forward to hearing from you, and thank you in advance for your support. WINTER HOURS - On November 1, 2016, we will be open on Saturday's (10 A - 4 P), and by appointment. We will continue to respond to e-mail questions, regular mail, and phone messages. NEW IN THE GIFT SHOP - Our gift shop now has reproductions of eight 1903 water colors images of Warm Springs, individual or in a set. We also have these images available on notecards. To order, please see our Retail Page. Wonderful Christmas Present!!! A number of guests visiting from the Virginia Historical Society enjoyed a tour of the Bath museum hosted by Rick Armstrong, while Nell Carpenter narrated a slideshow of the museum's Hoover photographs.